The Eagle Pub in Bene’t Street, Cambridge, has a great atmosphere. It’s cosy, yet with a real buzz too, and has a number of separate rooms in which to eat or drink, each with reasons to recommend them. The back room is especially atmospheric. Known as the RAF bar, it’s covered with graffiti scrawled there by Second World War pilots using lipstick, cigarette lighters and wax. 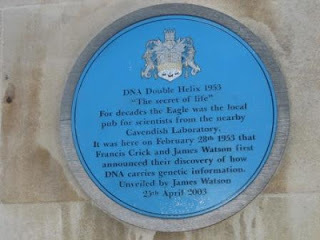 And this was the pub where the discoverers of DNA, James Watson and Francis Crick, famously announced and celebrated their success. As I look out of my window at the rain, the pub’s beer garden almost seems irrelevant, but it’s a great bonus in the summer. At our most recent visit we ordered food in what I imagine is one of the most challenging timeslots of the week: 3.30pm on Sunday. The pub was still crowded, with just one or two tables spare, and, after the lunchtime rush, they’d run out of some dishes. However, the welcome was as warm as ever, and although we were told we might have to wait forty minutes for our food, in reality it was only around twenty. Sunday options revolved around roasts with all the trimmings. The vegetables were lovely and fresh, but again, our timing wasn’t great, and the potatoes were only just done, I imagine as a result of pressure in the kitchen. The vegetarian option was beautifully presented and imaginative: a mushroom, brie and hazelnut wellington in the shape of a star, with all the standard vegetables alongside. It was the only veggie option, so if that had run out some of us would have been stuck, but it was delicious and avoided being too rich alongside the roast potatoes. Main courses came in at around £9. The puddings we sampled were Bramley apple lattice, again beautifully presented with a dusting of icing sugar, and chocolate brownies with a rich sauce. These were delicious and the helpings of the latter particularly generous. None of our party wanted them quite as described (requests were made to swap custard for cream or ice cream, according to taste). This was all handled willingly and accurately. To sum up, I would thoroughly recommend the Eagle, but there are probably better times to rock up than mid-afternoon on a Sunday. The first loos you come to are down some fairly steep stairs, but there are accessible ones at the back of the pub. At the time of writing, food is served from lunchtime on Sundays until 10pm, except between 4 and 4.30pm. If you’re hosting visitors in the city and want some local colour, it’s a top place to visit. It also has a nice range of merchandise available for anyone wanting a souvenir or for those after Cambridge-themed presents. These range from Eagle T-shirts and mugs, reflecting the pub’s history, to key rings and fridge magnets.